There are many resources available for reviewing Part D drug plans. 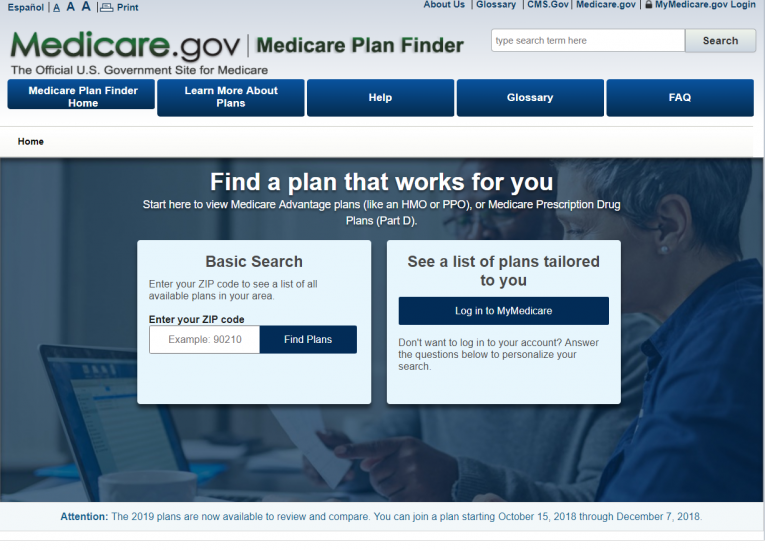 Regardless of who helps you with your review, the tool being used is the Medicare Plan Finder on the Medicare website. If you are tech savvy, you could even try it yourself! 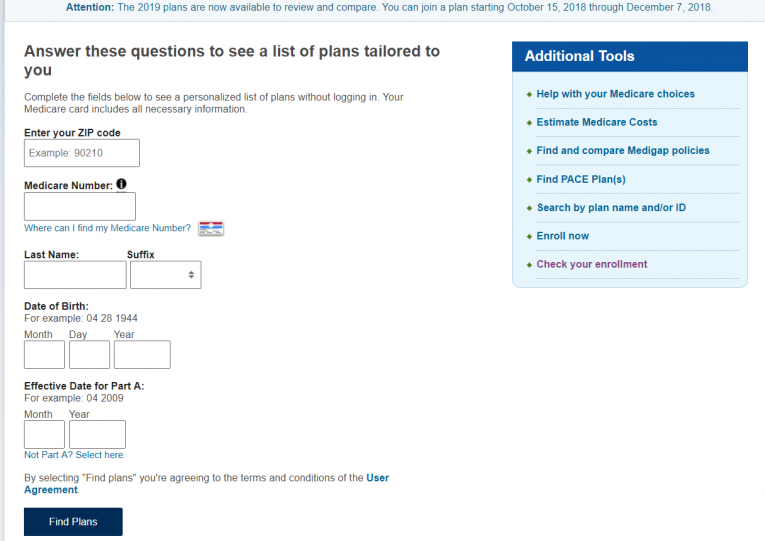 This article provides a step-by-step tutorial on how to use the Medicare Plan Finder. Have your medication list handy before you begin. If you decide you'd prefer the help of a Medicare Specialist, simply scroll down to the end of this article, download the Medication Worksheet, and request a review. Next year's plans become available every year on October 1st and changes can be made anytime between October 15th and December 7th. You can change your plan more than once. The last change made before the end of the day on December 7th will be the plan that becomes effective January 1st. If no change is made, your current plan will automatically renew. 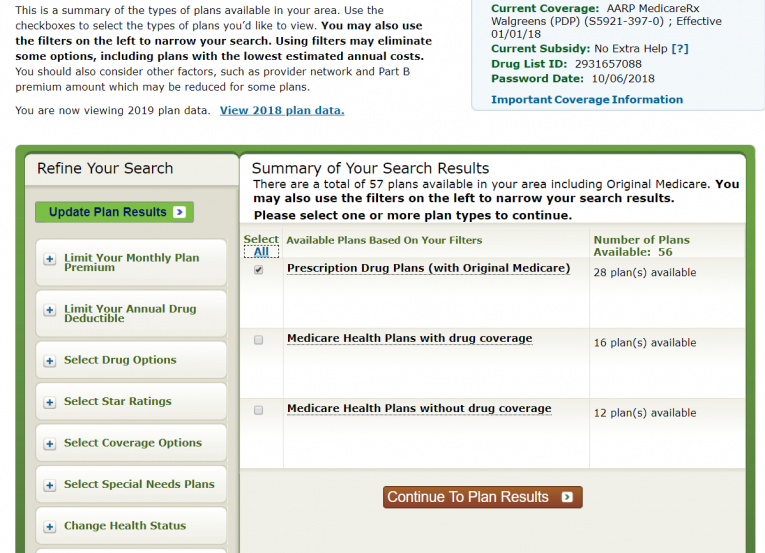 Click on the green button on the left "Find health & drug plans". It will take you to the Medicare Plan Finder. You can start a basic search by entering your zip code and clicking on "Find Plans". If you'd like to be able to compare your current plan to other plans available next year, simply scroll down and answer the questions below. It's not necessary to have a MyMedicare account. Enter your zip code, Medicare number, last name, date of birth, and Medicare Part A effective date. Then click "Find Plans". You will be prompted to enter your medications on the following screen. In Step 2 of 4: Enter Your Drugs, you will be prompted to "Type the name of your drug". Once you start typing, options will appear. Select the name of your drug when you see it. The most common dosage will be pre-selected. If you take a different dosage, make the correction and click "Add drug and dosage". Continue until you have added all of your prescribed medications. Don't add over the counter drugs. When you are finished, click "My drug list is complete". Note: if you have a Drug List ID and Password Date, you can add them on the right-hand side and your drug list will appear. If not, enter your medications. Once you begin to enter them, a Drug List ID and Password Date will be generated. You can record this information to bring up your drug list in the future. Your drug list can be updated at anytime. 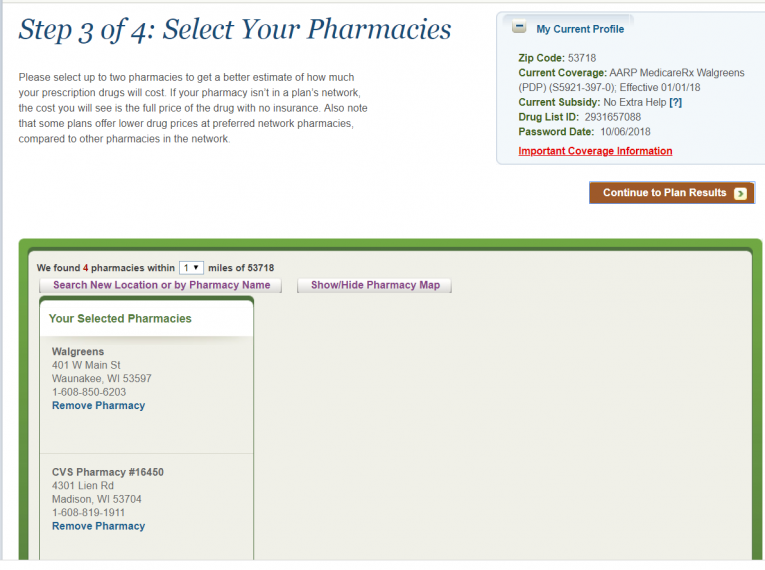 When you get to Step 3 of 4: Select your Pharmacies, you can compare up to two pharmacies. If you really like your pharmacy and wouldn't switch without significant savings, only enter your preferred pharmacy and the plans that work best with that pharmacy will show up in your results. If you would be willing to switch your pharmacy to get the lowest possible total costs, then include a CVS or Walgreens along with your preferred pharmacy. In our example, this person currently uses Walgreens but is willing to compare it to CVS. Once you have made your selection, click "Continue to Plan Results." In Step 4 of 4: Refine Your Results, be sure to select the top option, "Prescription Drug Plans (with Original Medicare)". Then click "Continue To Plan Results". Note: If you select the other options, you will be shown Medicare Advantage Plans in your area. Remember, if you enroll in a Medicare Advantage plan you will be removed from Original Medicare and lose your supplement! You can review and/or change your drug plan without affecting your Original Medicare or your Medicare supplement. Also Note: Above the summary of your search results, it will say You are now viewing 2019 plan data. If you want 2018 data, click View 2018 plan data. When you get to Your Plan Results, you will see your current plan listed on top (if you selected a personalized search). Be sure to select it and scroll down past Original Medicare. In this example, the current plan is AARP Medicare Rx Walgreens. You don't want to select Original Medicare since you are not considering Original Medicare alone. Continue to scroll down and you will see the top 10 prescription drug plans in your area. 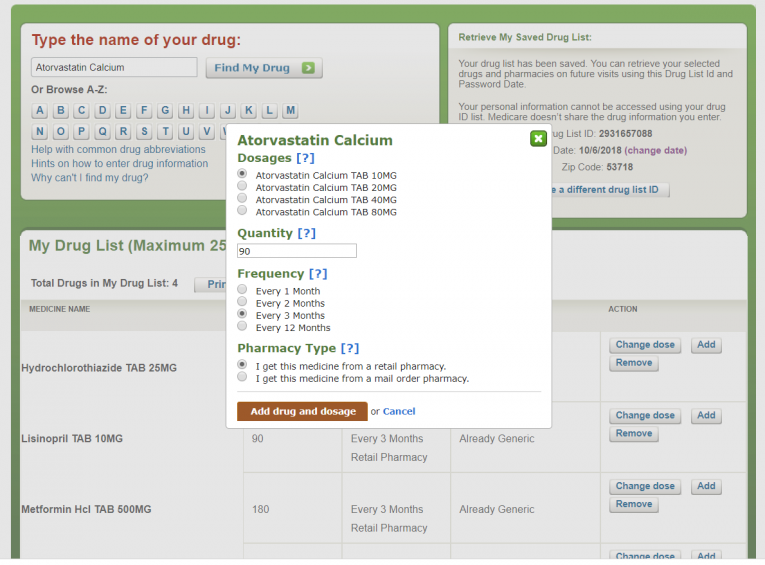 The results are sorted by the "Lowest Estimated Annual Retail Drug Cost" You can choose from a menu of options to change the way the results are sorted. Just click on the down arrow in the end of the white box. If you like mail order, you might consider having your results sorted by "Lowest remainder of the year mail order costs". 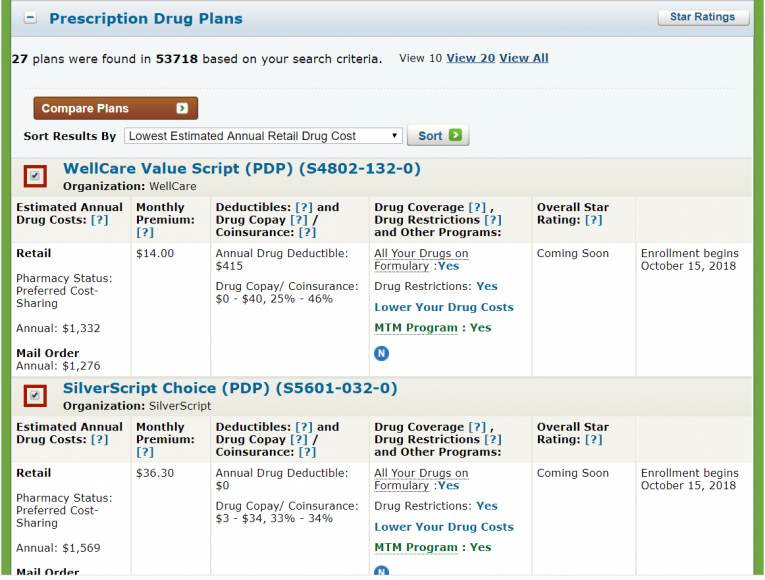 In this example, the top two plans using a retail pharmacy are WellCare Value Script and SilverScript Choice. 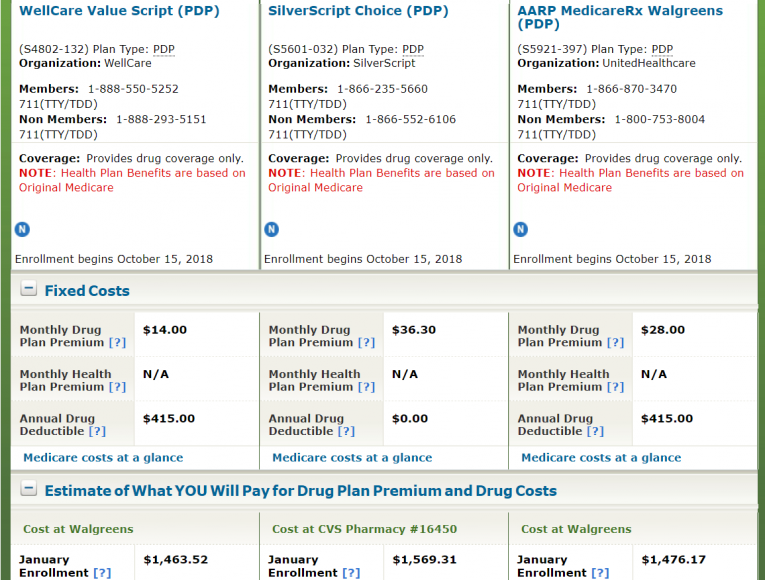 You can compare up to 3 plans at once, so we will select them along with the current AARP Medicare Rx Walgreens plan. Then we will click "Compare Plans". On this page you will see the three plans side by side. First, the monthly premiums are listed. Next, the annual drug deductible, if there is one. 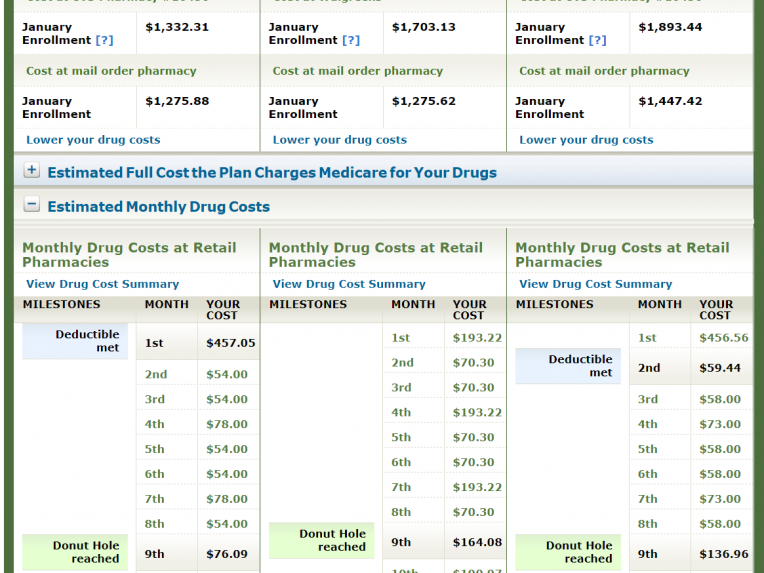 As you scroll down you'll see your total annual costs (for plan premium and drug costs) at each pharmacy. You can see that if the person in this example wanted to stay with Walgreens, there would be a very small amount of savings to switch from the AARP plan to the WellCare plan ($1476.17 - $1,463.52 = $12.65 annual savings). We would recommend staying on the current AARP Medicare Rx Walgreens drug plan for the following year. However, if this person was willing to change to CVS or mail order there could be a few hundred dollars in savings. Continue to scroll down to see the costs using each plan at both pharmacies as well as mail order. The greatest savings would be to switch to SilverScript and get set up with the SilverScript mail order program. That would provide an annual savings of $1,476.16 - $1,275.62 = $200.54. Switching to WellCare and CVS provides nearly the same savings. Switching to SilverScript would also eliminate a deductible, which would be especially nice if more brand name drugs were prescribed later in the year. Regardless of the plan chosen, this person will hit the donut hole (coverage gap) in September (9th month) due to the high total cost of Xarelto. 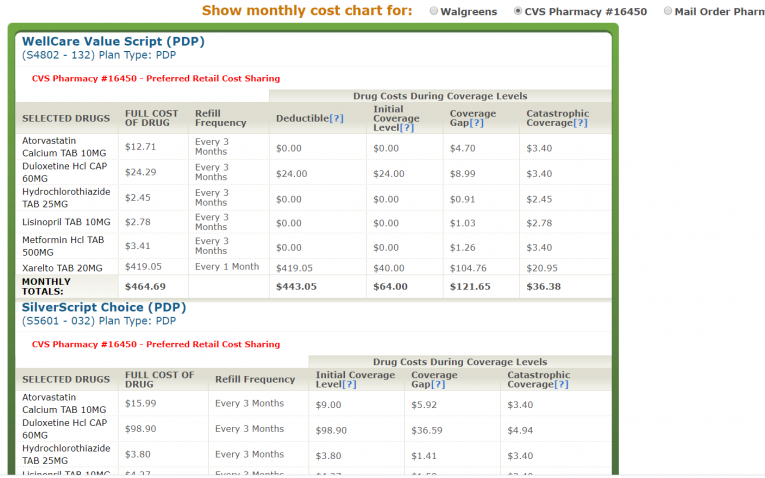 To get a breakdown of the cost of each medication using each plan at Walgreens, CVS or mail order, click "View Drug Cost Summary". This is the first time that a new window will open. To go back, you'll need to find the previous window tab at the top of your computer screen. Notice the top of the screen shows both retail pharmacies as well as mail order. You can click on each to view the co-pays you would pay using each of the three options. In this example, we will assume the individual is willing to switch from Walgreens to CVS pharmacy, but prefers not to use mail order and doesn't mind having a deductible. The recommendation would be to switch to WellCare Value Script for $14/month. Four out of six medications in this drug list would have $0 co-pays using this plan at CVS. Duloxetine would be $24 for a three month supply. This person would need to pay the full cost of Xarelto ($419.05) up to the deductible of $415 before paying the $40 co-pay listed in the "Initial Coverage Level" column. 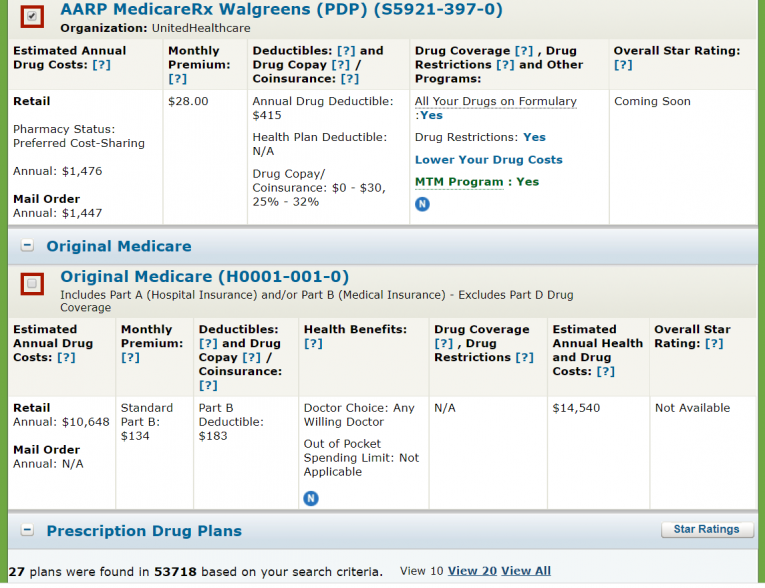 Note that the Medicare Plan Finder has a major flaw. It lists Monthly Totals even when you enter a 3 month supply for some of your drugs. I recommend ignoring the Monthly Total. Also note that if the total cost of your drugs (what you AND your plan pays) reaches $3,820 you will enter the Donut Hole and should expect to pay the co-pays listed under the "Coverage Gap" column, most likely for the rest of the year. You need to pay $5,100 out of your own pocket before you can leave the Donut Hole (Coverage Gap) and enter the "Catastrophic Coverage" level. Very few will enter this level. To enroll in a plan, you'll need to go back to "Your Plan Results" in the previous window. To the right of the plan name will be an "Enroll" button (starting October 15th). You will be prompted to enter your information to complete the enrollment process. If you'd prefer the help of a Medicare Specialist, please request assistance via email to: al@frankseniorinsurance.com. For assistance with your review, include a completed Medication Worksheet (see below) in your email or mail it to the address at the bottom of the form. We are happy to help!